My Brain: You know who hasn’t heard about how awesome knitting is? Your BLOG! Remember when you used to write things with your fingers? Me: 10…11…12…slip purlwise …slip knitwise … knit together through the — I’m sorry, what? My Brain: Your blog! You used to write things. Not regularly, mind you. But occasionally. To say nothing of fiction. When is the last time you actually wrote one of those random scenes that float around up here and clutter up the place? 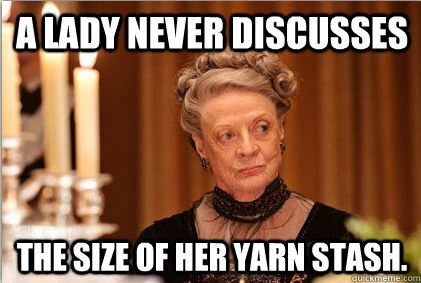 Me: Well, yeah… but then I’d have to stop knitting. My Brain: …sigh… Good Talk. Let’s do this again next week. You know that thing I do where I find a video game that really pulls my attention and it’s pretty much all that I do until the game is over or something inside me snaps out of it? This is what’s happened with knitting and crocheting. Seriously, it’s gotten pretty bad. I had been flirting with knitting for several years, and some time after Christmas this past year (where I picked up some pretty fantastic Loki-themed yarn from a friend) a switch flipped in my brain and I haven’t looked back. It is seriously just like video games except for one important difference, at the end of 3 hours of grinding, i haven’t just moved a few 1’s and 0’s around in a data file, I’ve made a whole thing. So just as soothing to my “gotta make progress” needs, but with bonus LITERAL loot at the end of it. Scarves are just the beginning, actually. I’ve knitted several pairs of fingerless gloves, baby blankets, hats & head bands, stuffed bunnies for Easter, lovies for babies and even a couple of pairs of socks. Socks are weird – take a look at a pair and try to follow the lines of stitches and you’ll see what I mean. I have a few Christmas gifts to take care of and I’m probably going to try my hand at a sweater. Or maybe something with Cables – both are the next “level” of knitting I’m climbing towards. Knitting does have one major shortcoming: No Story. Sure, watching TV is possible for most projects I have, and I’ve even more-or-less mastered the ability to knit basic stitches while reading on the Kindle, but after about 8 months of prioritizing knitting/crocheting over any of my story-gathering/creating outlets, I’m starting to really, really miss it.